The annual barbecue evening for the girl friends demands, that we ends the evening by baking twist breads. This year I used this recipe on Politiken twist bread as inspiration with my own twists. I decided to add some marple syrup as the use of marple syrup in favourite bread of mine manitoba bread with marple syrup gives some extra to the taste, which I think comes of the caramelisation during the baking process. I did not find the taste note in these twist breads, which could be due to, that baking is more severe during the baking in fan oven at 250'C. I also decided to add some chai sugar to boost the spicyness. I think could have used 1 teaspoon instead of 3/4 teaspoon, but I was uncertain, if the chai would have been to dominating. Instead of chai sugar you could use cinnamone. I really liked the texture of the twist bread, so I think I will use the basic dough for coming twist bread baking. I have been buying these sticks for baking twist breads, which some of my girl friends have been very disapproving of, as they wanted to bake their twist bread on the traditional wood sticks. Finally this year I heard a very positive comment concerning the sticks. When the twist bread is taken off the stick, the inner core is actually baked as well compared to the traditional wood stick, perhaps due to the metallic part of these twist bread sticks. 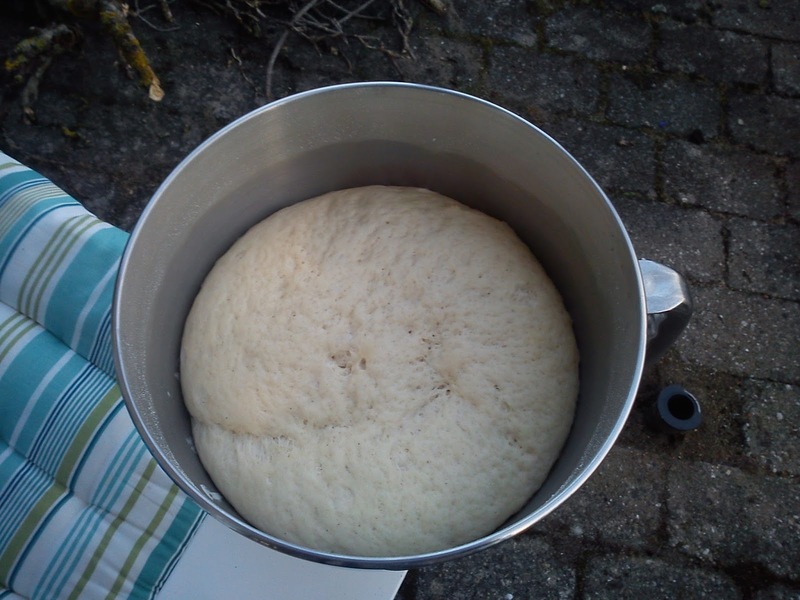 Any leftover twist bread dough can be baked at buns afterwards at 220'C for 15-20 minutes. Dissolve the yeast in the milk. Pour in the marple syrup. Add wheat flour, sugar and salt in the mixing bowl on the stand alone mixer. Mix at speed 2 for 1 minute. Crumble the butter pieces into the flour part using your hands. Add in the milk part in the flour part. Mix at speed 2 for 6-8 minutes. Cover the mixing bowl with a tea towel and let the dough rest for 2-4 hours at room temperature, until it is time for baking the twist bread. 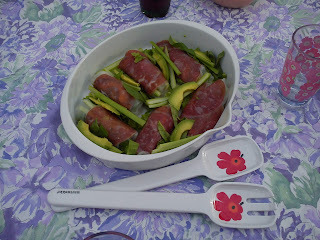 Divide the dough into smaller portions, and roll each piece into a long piece, which when is twisted around the stick. 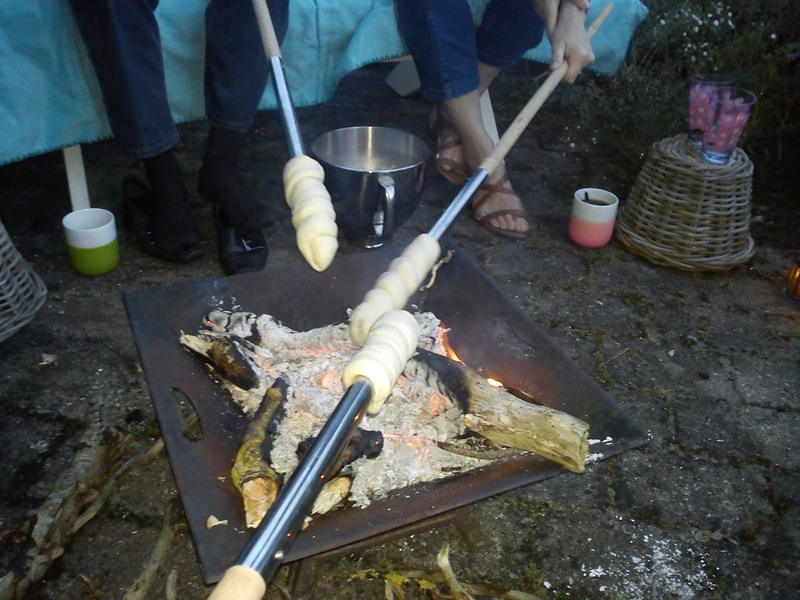 Hold the stick with dough over bonfire glows or barbecue charcoals. Bake for 8-12 minutes or until the twist bread easily can be removed from the stick. Fill the hole in the twist bread with jam, speculoos, Nutella or chocolate. When I saw this recipe on blackberry drink in the weekly magazine Søndag (issue 31/2016), I knew at once, that I would serve this drink for the girl friends as the annual barbecue evening. This drink taste great, almost like cordial however not to be served for children !!! I have also tried to use some of the blackberry cordial together with sparkling wine, which taste fantastic almost like kir royal. 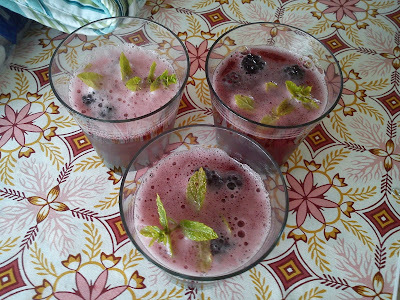 Place the frozen blackberries together with the mint stems in the drink glasses. Mix blackberry cordial, gin and sparkling water in a glass jug. Pour this liquid into the drinks glasses. If desired place some ice cubes in the drink glasses. 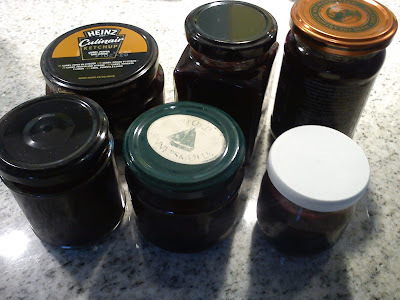 This is not a jam recipe, but a chutney recipe, which in my opinion also fits into this month theme of jam. My good friends in Horsens have a garden full of plum trees, which gives them a surplus being freely shared amongs their friends. So I recently receive a portion of 3-4 kg plums, which I either enjoy fresh or make more storable by in this case making chutney. 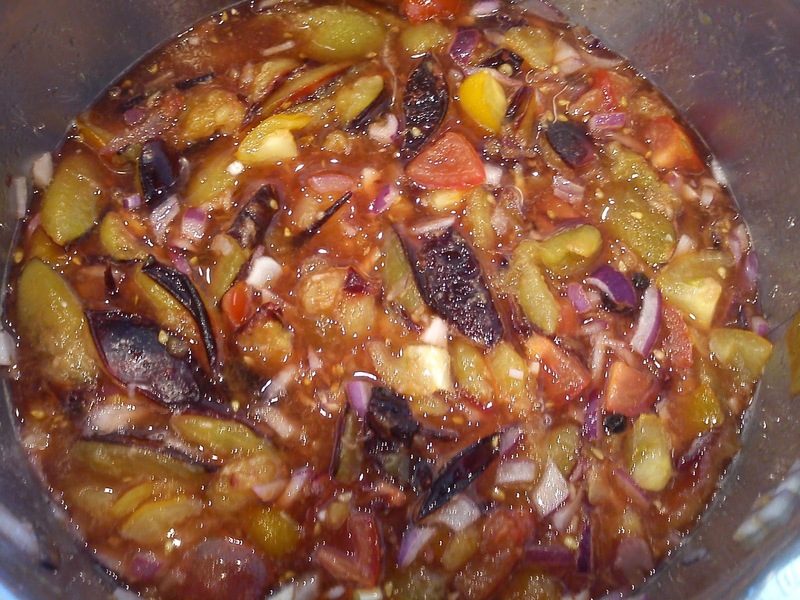 I have found this recipe on plum tomato chutney, where I have a few modifications, so it fitted to the available ingredients in my kichen. Add all the ingredients in a medium cooking pot. Let everything boil gentle for 1 hour without lid. Pout the chutney into glasses, which have been prepared by boiling water. Let the chutney stored for 1-2 weeks, before you start using it. 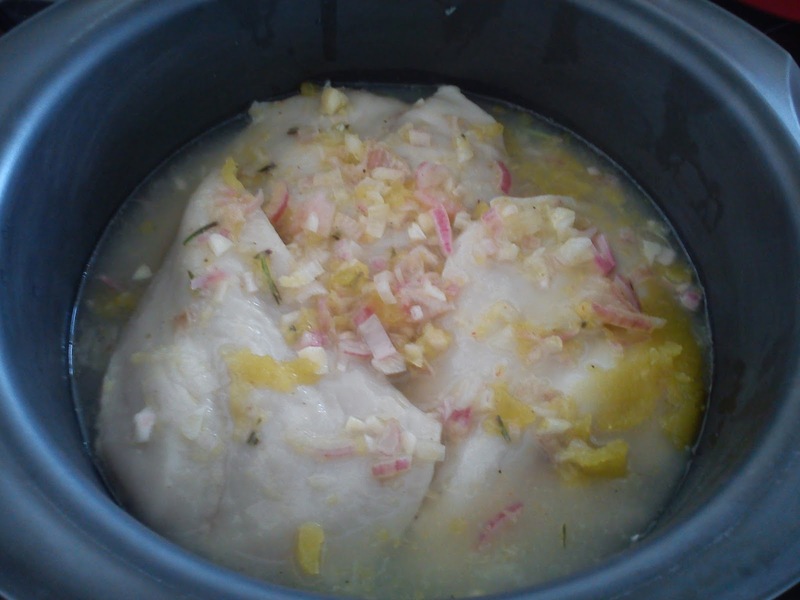 The lemon marinade can be used for white fish, poultry and seafood. I have so fare only used this marinade for chicken breast. I usually marinade a few extra chicken breasts, which I freeze down for later use. Add all the ingredients in a medium bowl.Stir everything together. Place the chicken breasts in a container with lid and pour the marinade. Turn the container up-side down every 2-4 hours. Marinade for minimum 4 hours and up to 8 hours. Cook the chicken breasts in the marinade in a baking tray with lid to keep the chicken breasts juicy at 200-220'C for 20 minutes. 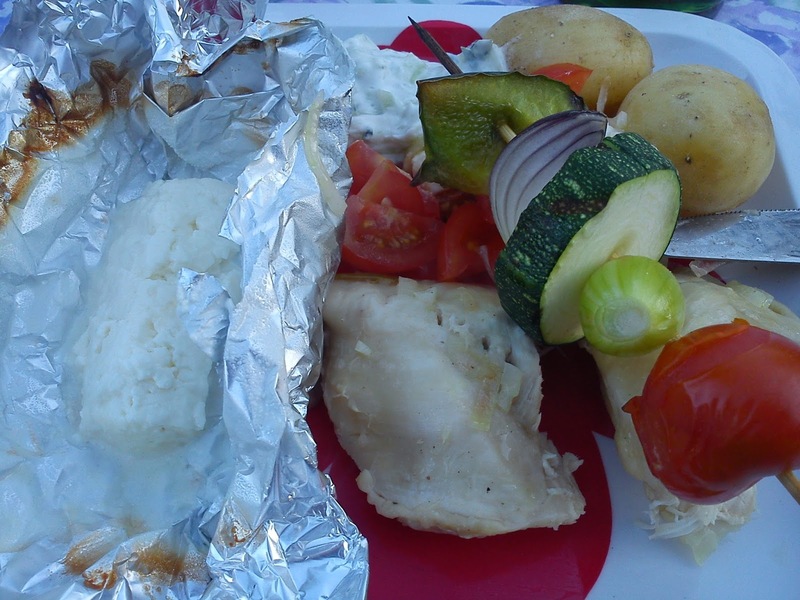 Another option is wrap the chicken breasts in alu folio and cook these packs on the grill for 20 minutes. 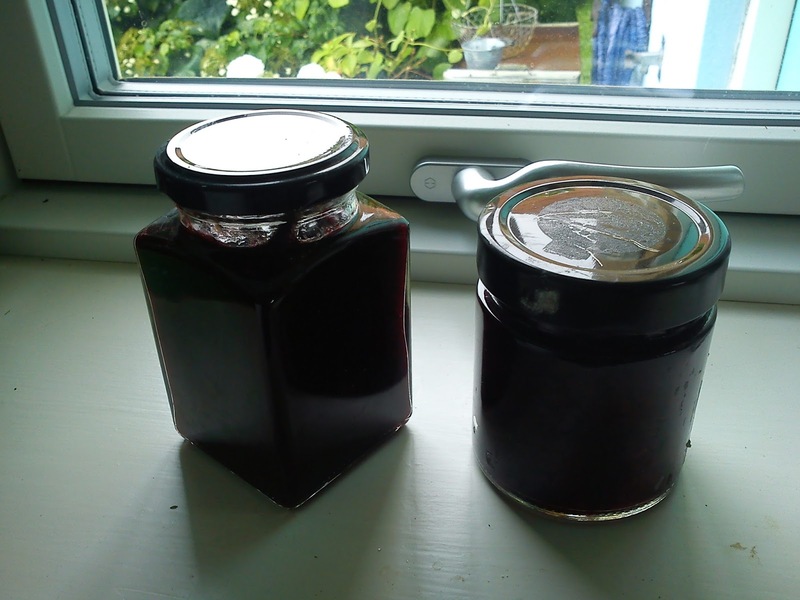 In the weekly magazine Søndag (issue 31/2016) I found this recipe on blackberry jam & cordial, where I got the opportunity of using some more of by frozen blackberries, and thereby clear the stock in the freezer at work !! I decided to stick to the recipe without making any modification, despite the fact that no pectin is used for making the jam. The reason is, that the jam is drained from the liquid phase after cooking, and the liquid phase is used as cordial. Normally I would use pectin to jelly the entire fruit and liquid phase into one spreadable/gellified jam. Add blackberries, water, sugar, vanilla pod & corn, thyme leaves and water into a cooking pot. Bring to the boil, and let is boil gentle for 15 minutes. Place the blackberry mass in a sieve, so split the mass into liquid and fruit phase. Store the boiled blackberries as jam on glasses, which have been cleaned in boiling water before use. 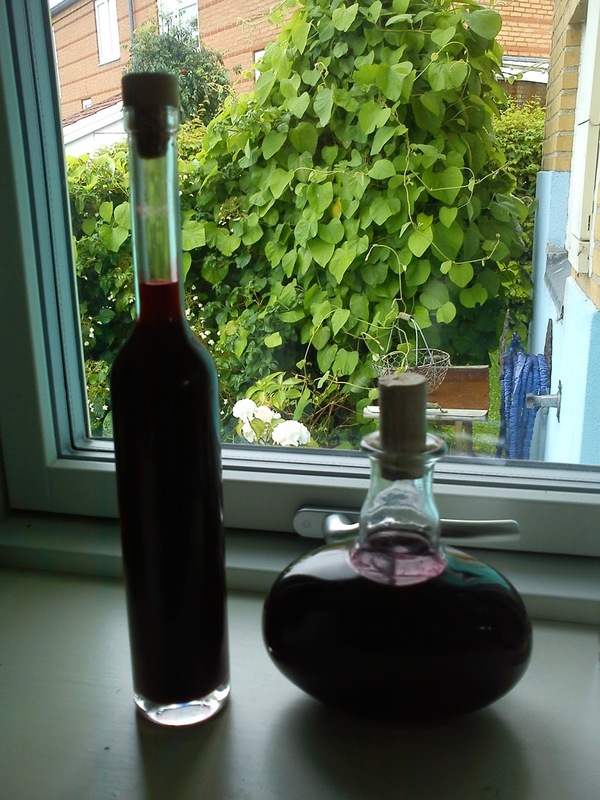 Store the liquid phase as blackberry cordial on bottles, which have cleaned beforehand with boiling water. 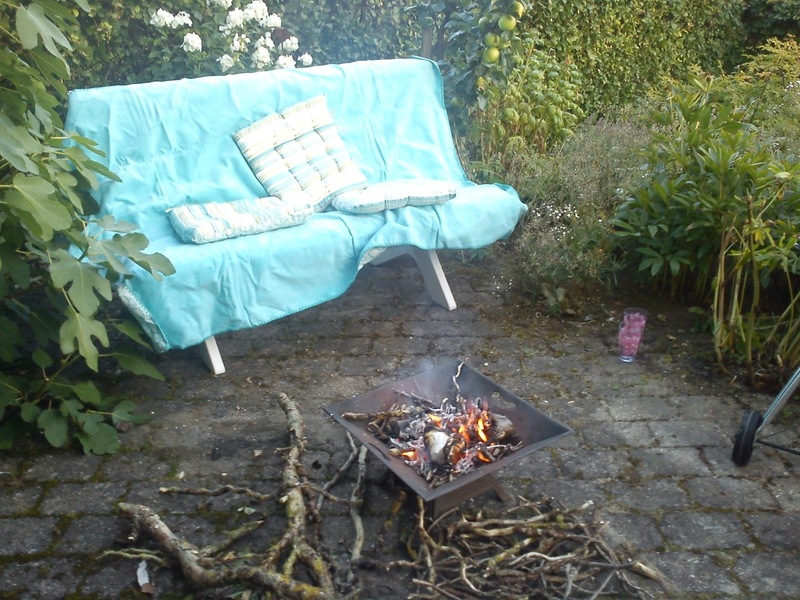 Yesterday evening a group of great friends as usual meet in my little garden for the yearly barbecue event, where all participants bring their part of the food. I take care of the firing up the grill, the liquid part of the menu and the sweet dessert part. 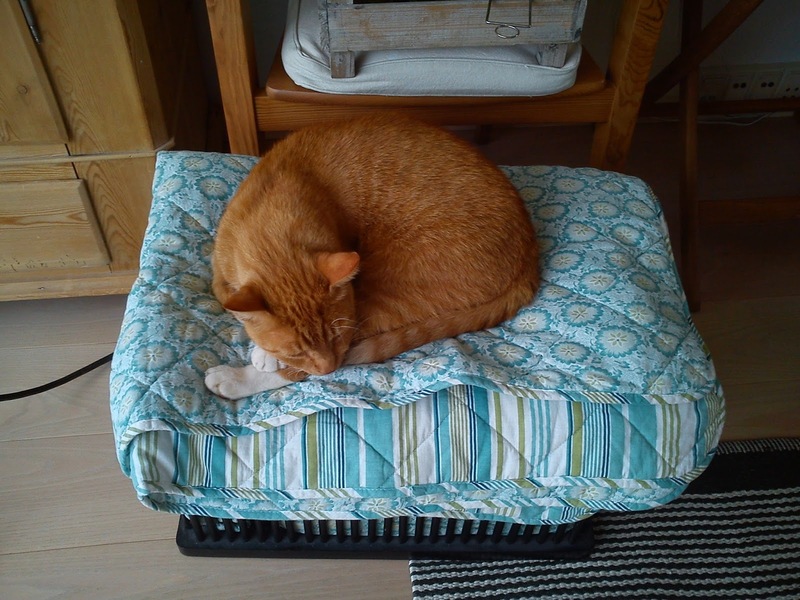 Hannibal the Cat thought, that the box with plaids and cushions for later use was his very own fairytale bed without the pea as bottom layer. I was debating with myself the entire day, whether we could sit outside or not due to rain showers coming and going. 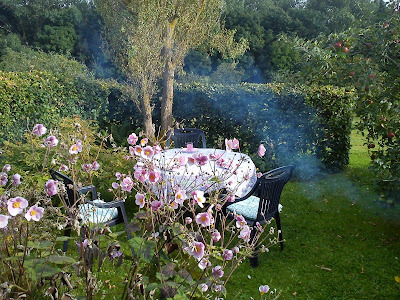 However, as the guests arrived, so did the evening sunshine, so we could sit outside in the barbecue and bun fire smoke. We started the evening with blackberry drink with gin inside. It really tastes like cordial with sparkles :-) I could easily become addicted to this drink. The main course was lemon marinated chicken, which barbecued in alu folio for 20 minutes. The finishing part of the barbecue evening was the classic bonfire on the patio, which is used for both heating and baking of twist bread with butter and marple syrup. The grill charcoal was used for making baked figs from my big fig tree standing on the patio. 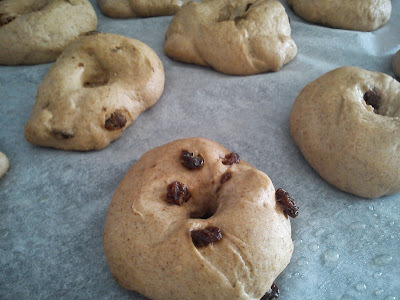 I found a new recipe on bagels, which time in BBC GoodFood (issue February 2014), so I have been baking in my kitchen, while the weather is very rainy and windy outside just like Autumn !!! One important tip, which I want to share with you, is, that the baking paper should be greased with oil, before the bagel dough is placed on the baking paper prior to the raising process. If you do this, you will be able to take the bagel off without destroying the shape after the raising process. If you not do grease the baking paper with oil, it will be very difficult to move the bagel into the boiling water, and you needed up with flat and strange looking bagels !!! This little trick is not mentioned in BBC GoodFood. Add salt and sugar into the water, mix together for 1-2 minutes on the stand alone mixer (speed 1). Add the flour and knead the dough for 5-6 minutes on an stand alone mixer (speed 2). Let the dough raise for 1 hour in the mixing bowl. Divide the dough into 90 g.
Cover the dough with tea towel, and let the dough raise for 30 minutes. Heat up a large cooking pot with water to the boiling point incl. the baking soda. The baking soda should give shine and chew to the baked bagel. Cook the bagel dough for approx ½ minute on each side. It is possible to cook 2 bagels at a time, if you use a large cooking pot. Bake the cooked bagels for 20-25 minutes at 180'C in the upper part of the oven, until the bagels are golden. My mother has a blueberry bush in her garden, and this year we have even covered this bush in a net, but still no blueberries from my mother garden !!! However, blueberries are in season right here and now, so you can fresh local blueberries in the supermarkets for low amount of money. So this blueberry jam has been made with a helping hand from my local supermarket. Add the water, blueberries, vanilla corn and pod to a cooking pot. Heat up the fruit to the boil. Dry-mix pectin with 50 g of the sugar. 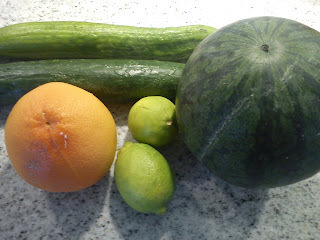 Add this pectin-sugar dry-mix, while agitation very well to the fruit. 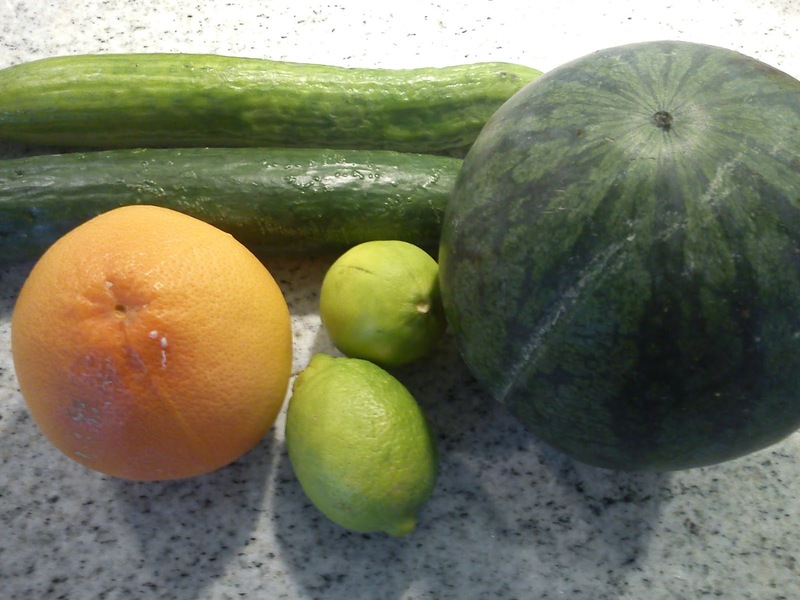 It is important NOT to add the sugar at this stage, as the gelling powder need the water from the fruit to hydrate sufficiently. Let the fruit gentle cook for 5 minutes. Add the rest of the sugar to the fruit. Add the sugar to the fruit. It is very important, that you add the sugar little by little, while you agitate, in order to pre-gelling/gel lumps in the jam. Let the jam cook for another 2 minutes. Taste the jam, decide is you would like more sweetness or acidity in the final jam. Add salt, sugar, cinnamon and raisins into the water, mix together for 1-2 minutes on the stand alone mixer (speed 1). Yet another ceramic tea cup in my favourite colour of green, which time by Anne Black, which also is the designer of my kitchen handles. 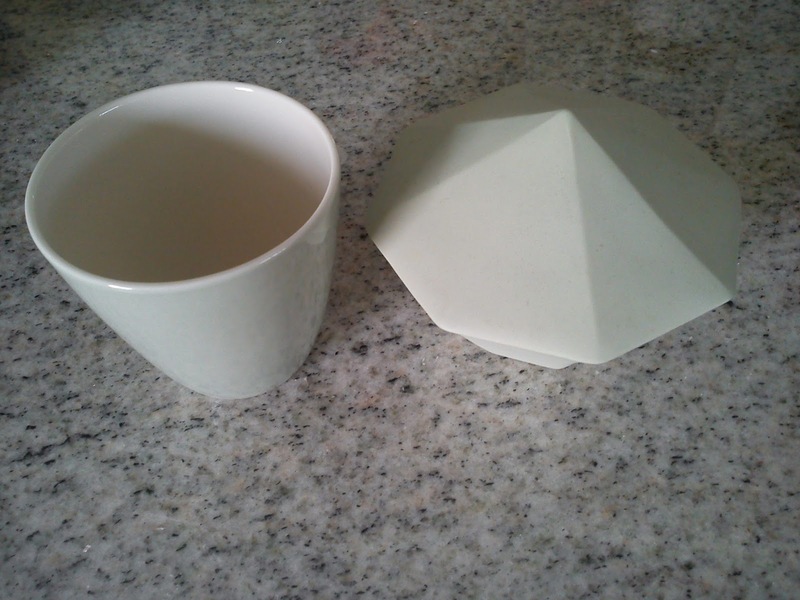 Perhaps I should share a photo of my many green ceramic tea cups and bowl with you ? Well, in Denmark we have two seasons, the white Winter and the green Winter. And the green Winter is the coldest, as we have no heating on, as the calendar states, that it is the Summer period ! In July the theme of my kitchen was rhubarb, where I tried out 6 different recipes with rhubarb as key ingredients (crumble cake with rhubarb, rhubarb liqeuer, rhubarb cake, rhubarb liqeuer with vanilla, rhubarb shot, oat cookies with rhubarb). Here in August, which should be the last month of Summer, if the Summer will come more than a few hours from time to time, the focus for me in my little kitchen is to make various jams as a way of saving the Summer time for later, where you can open a glass full of Summer taste. 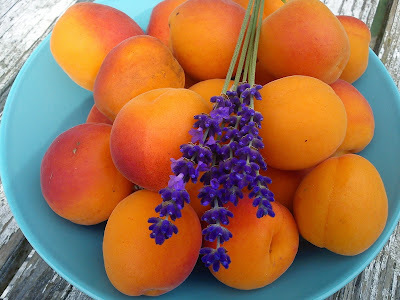 As inspiration I will share this recipe of apricot jam with lavender, which was reviewed as one of the five best home-made jam in 2014 !!! 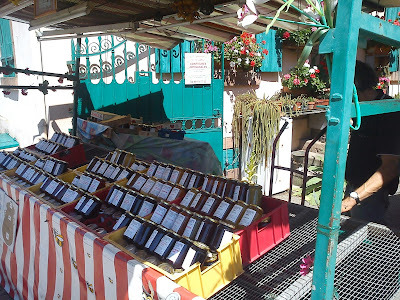 So perhaps I should make my very own jam shop next to my kitchen door selling my jam surplus ? I was having quiet some expectation to this SUMMERJUICE, when I was the use of 1 watermelon. 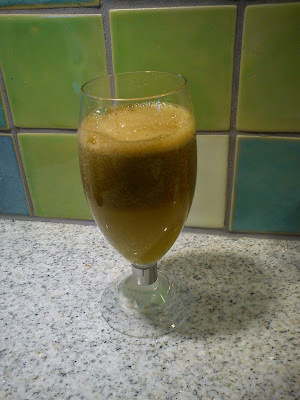 However, the taste is to the bitter side due to the lime incl the peel and the grapefruit without peel, so I will not make this juice again on my own free vile.